While riding sharing through Uber the other day, the driver told us about how his life was changed with this service. He told us how Uber gave him enough money to sustain himself, and how before this app, he was pretty much homeless. After hearing this, I thought to myself, "If all of the men now have the option to make money with Uber, what way do women have to make money." At the same time, I heard increasingly in the news about how obesity rates in America are rising and how they are already at an all time high of 37%. Combined with these two issues, I came up with the perfect solution that both gives people cheap healthy food and moms supplementary money. foodShare provides a solution that not only appeals to the general public, but also cooking moms who have the ability to make quality food. With our plan, chefs will be able to post what they will be cooking 3-5 hours before they actually prepare it. The beauty of this app is that chefs can post a food that they were going to make for their family anyways, but ended up making a little bit extra to sell. Once posted, users will have the ability to search for a specific cuisine of food and browse through all of the chef listings. When they find something they like, they can buy the food and either choose to pick up or have the food delivered to them. Once the chef receives all of his/her orders, he/she will prepare the meal and then deliver the food for whoever asked for the delivery. While the user in this process gets to enjoy healthier and cheaper options than most restaurants, chefs have the option to create their own small business and make some extra money. I mainly used swift and Xcode to build my iOS application. I used Firebase Database to upload all chef postings in real time and to retrieve data efficiently. 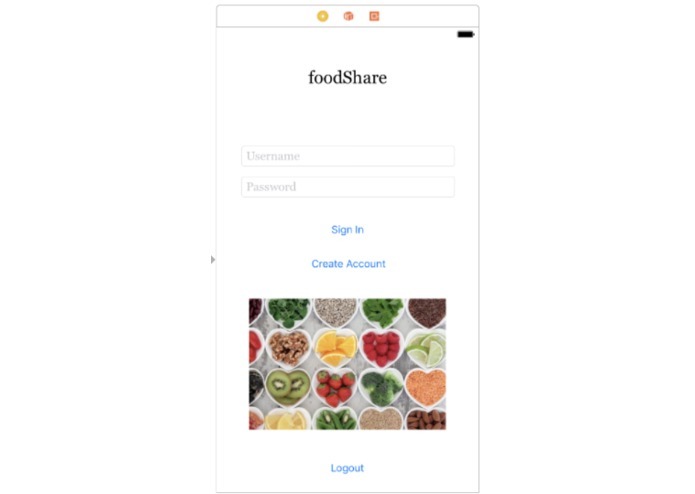 At the same time, I used Firebase Authorization to authorize users of my application, both chefs and customers. I ran into many challenges, including retrieving data from the database and authorizing users. However, after much hard work and dedication, I go them to work. I am really proud of implementing Firebase Authorization and Firebase Database, as I had no previous experience with these services before. I learned about Firebase and how useful it is for any user-based application. I also learned all about TableViews, including filling information into them. foodShare has a lot coming up. With my idea, I hope to eventually found a company and hire some co-workers to beautify and perfect this application. After it is fully ready, I plan to launch the app on the appstore. I was the lead programmer, designer, and editor.